What can the great crises of the past teach us about contemporary revolutions? Jack Goldstone shows the important role of population changes, youth bulges, urbanization, elite divisions, and fiscal crises in creating major political crises. Goldstone shows how state breakdowns in both western monarchies and Asian empires followed the same patterns, triggered when inflexible political, economic, and social institutions were overwhelmed by cumulative changes in population structure that collided with popular aspirations and state-elite relations. Examining the great revolutions of Europe-the English and French Revolutions-and the great rebellions of Asia, which shattered dynasties in Ottoman Turkey, China, and Japan, he shows how long cycles of revolutionary crises and stability similarly shaped politics in Europe and Asia, but led to different outcomes. In this 25th anniversary edition, Goldstone reflects on the history of revolutions in the last twenty-five years, from the Philippines and other color revolutions to the Arab Uprisings and the rise of the Islamic State. In a new introduction, he re-examines his pioneering look at the role of population changes-such as rising youth cohorts, urbanization, shifting elite mobility--as continuing causal factors of revolutions and rebellions. The new concluding chapter updates his major theory and looks to the future of revolutions in the Middle East, Asia, and Africa. Books that significantly reorient fields of study are rare. Revolution and Rebellion in the Early Modern World did just that with the study of revolution when it first appeared in 1991. Rarer still are books that seem just as relevant, or perhaps more so, a quarter of a century after their initial release. As the new material in the 25th anniversary edition makes clear, Revolution and Rebellion belongs in this rarified second group as well. I read Revolution and Rebellion in the Early Modern World for the first time when I was a graduate student-a time when my own ideas about what to study and how to study it were just starting to gel. Jack Goldstone's now-classic book provided me with the tools to solve a range of puzzles related to social movement activism and consequences, public policy implementation, voting behavior, intergroup conflict, and inequality, and has powerfully shaped my own thinking over the past twenty-five years. His distinct analysis remains fresh, relevant, and broadly applicable today. Jack Goldstone's Revolution and Rebellion in the Early Modern World is as worthy of study and emulation today as it was 25 years ago. The book demonstrates clearly how outstanding works of comparative-historical analysis generate stable findings that hold up over the years. A stunning breakthrough in 1991 becomes a timeless classic in 2016. Jack Goldstone's powerful and persuasive book dramatically changed how we understand revolution; a generation later, it has lost none of its punch and proven prescient in any number of ways, not least about waves of revolution and the demographic trends that keep them real and relevant. An updated final chapter is a fitting coda and must-read for those interested in socio-political change. Theoretically sophisticated, substantively rich, and beautifully written, this remains a classic for our time and those to come. Revolution and Rebellion in the Early Modern World remains a classic in the lively literature on revolutions. 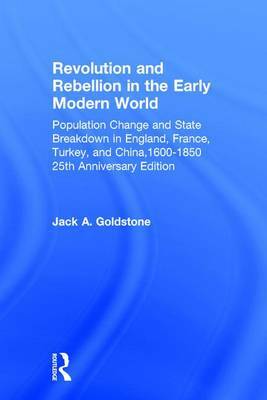 By broadening the scope to include revolutions that failed, Jack Goldstone is able to highlight the crucial role played by demographic transitions in prompting rebellion and revolution. This book, an essential contribution when it first appeared, is even more timely as we become more and more aware of environmental limits to economic growth. This remarkable and brilliant book arrives not a moment too soon... A major intellectual achievement which will redraw the map of early modern history. Surely the most interesting general statement on revolutions in a long time. A book of real stature-high powered, provocative, and ambitious.